Latitude Zero Discussioneers Dave Helfrey, Martin Vavra (front), Jeff Dean, Cindy Okumoto & Kyle Yount brave the depths of the Pacific Ocean and Caesar Romero's madness for this month's Daikaiju Discussion! Welcome to the second episode of the Kaijucast for 2011. Exciting times as we’re still in January and this is the first Daikaiju Discussion-centric show of the year. 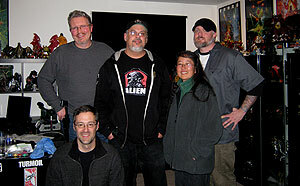 So this week I sat down with several of the guests from previous months: Martin Vavra, Cindy Okumoto, Jeff Dean and Dave Helfrey (better known as Baron Von Goolo) to watch the “classic” Toho scifi film Latitude Zero. What can I say? It sort of has a big monster in it? We’re swinging back to Godzilla this next month. 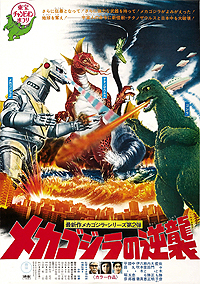 Your assignment, should you choose to accept it, is to watch TERROR OF MECHAGODZILLA (1975). This is the film for which Toho brought back Ishiro Honda and Akira Ifukube and its one of the only direct sequels to its previous film in the Showa era. This one is available from Classic Media in quite a nice format. If you don’t already have it, try and track down a copy for your own collection (also, try to avoid the older version – it’s pretty low quality). Email your thoughts, questions and reviews to controller@kaijucast.com by the last week of February – this next month is a short one, so don’t forget! Do you live in Seattle? Are you going to Emerald City Comicon? If the answer to either of these questions is “yes”, then I would love to hear from you. I’d like to organize a little get-together Saturday evening in between the show closing and the Masquerade. So email me and we’ll figure out a cool place to go. I’m hoping to get some of the guys from last year’s Crypticon Godzilla panel to go too. Thanks to everyone for all the emails, I think this new format is going swimmingly. You can download the newest episode of the Kaijucast right here. If you have friends that love Godzilla, maybe they’d like to give the Kaijucast a shot? Anyways, talk to you all in a couple of weeks!